Last year’s Shetland DK was so well received that I was very keen to repeat it with last summer’s (2017) clip. It arrived, hot from The Border Mill, just in time for Edinburgh Yarn Festival in March this year. This time round it has been spun at a Sport Weight (275m/100g) as well as DK (170m/100g, as per last year). Both are semi-worsted spun which gives a very buttery smooth yarn, quite different from a traditional woollen spun Shetland. 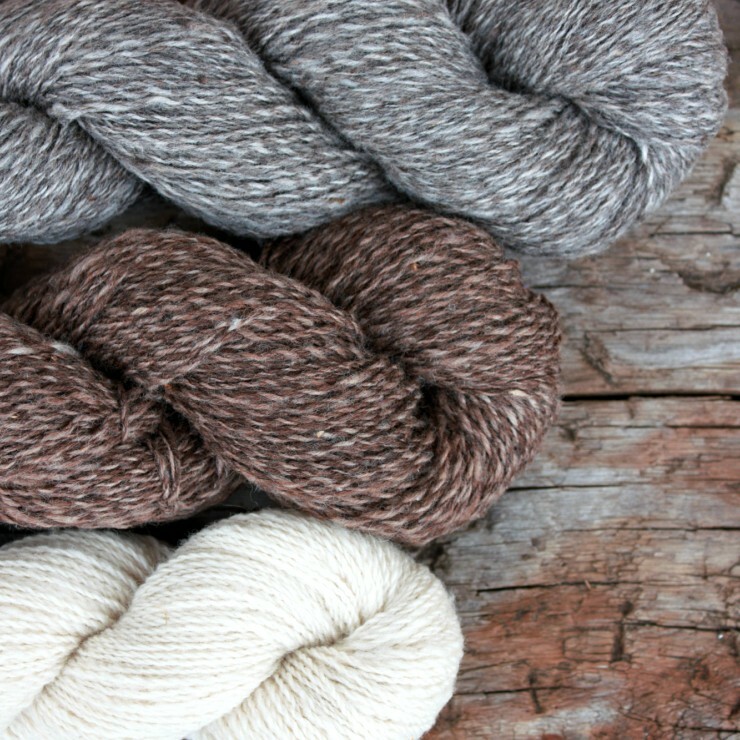 The Sport weight is a marl yarn with one ply each of two shades and we have three natural shades – Grey Marl, Fawn Marl and White. 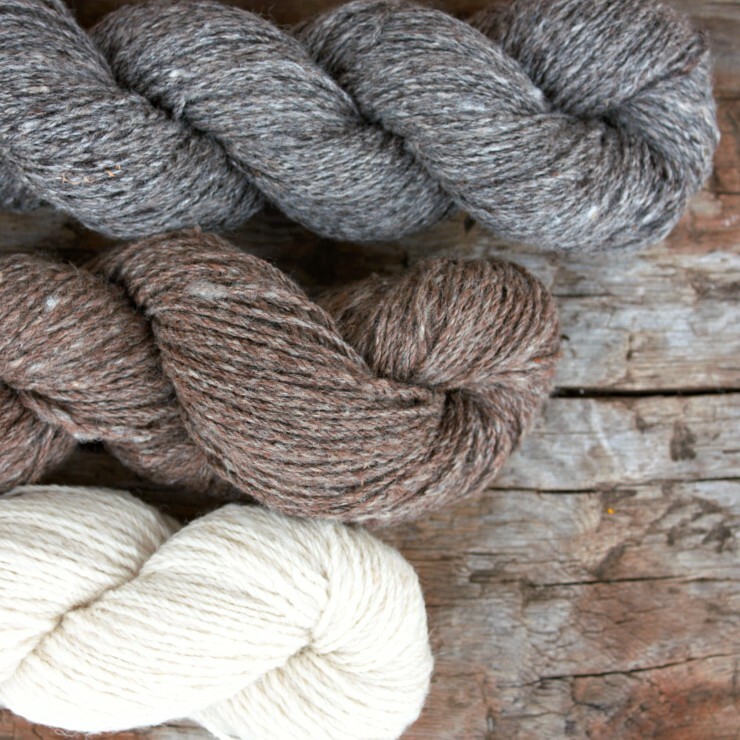 The DK is a heathered yarn, repeating the beautiful heather of last year, also with three natural shades – Grey Heather, Fawn Heather and White. The heathered effect is achieved with blending a variety of shades of wool along with white. Once again I found The Border Mill fantastic to work with. As well as their beautiful spinning, to make the most of this ‘scary fine’ wool, they put a great deal of effort into splitting up the various fleece colours to give the three finished shades in both of the yarn weights. I had in mind the final shades I was hoping to achieve with the yarns when I was selecting the fleeces – so I kept a rough count the quantity of fleece of each shade, as well as quality of fleece of course, when I was selecting them. I did approximately sort the fleeces into ‘Grey’, ‘Brown’ and ‘White’ before handing them over but I know that Kate (the Production Manager) then did a much more rigorous sort so that the heather and marl effects could be spun and so that there is approximately the same quantity of each shade in each yarn weight. Thank you Kate! 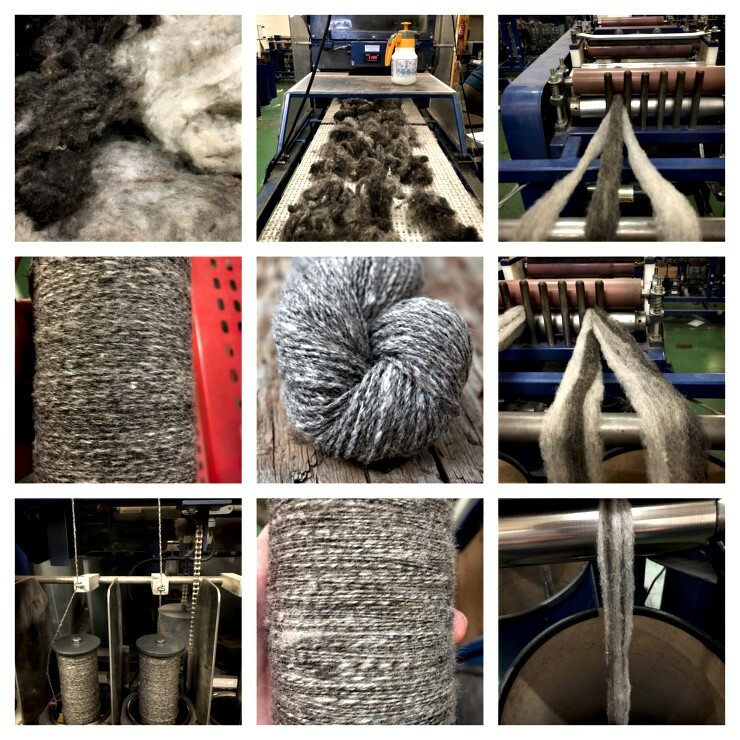 Kate took some great photos of the Grey Heather DK going through the mill – there’s a separate blog post here. This year the fleeces came from four different crofts and smallholdings. They are; Helendale Shetlands, Meadows Flock, Woodside Croft and Bogallan. You can find more information about the first three flocks in ‘Meet the Sheep‘ but I haven’t added Bogallan as yet as I haven’t got any photos, I was having so much fun choosing beautiful fleeces, when I visited Kathy last summer, that I forgot all about photographing her sheep. Suffice to say though that Kathy has a lovely flock – very eclectic, mostly Jacob and Shetland but she has quite a few other breeds thrown in too…….I don’t think Kathy can restist adding anything that seems a bit special! 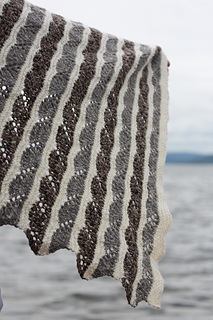 If you’re looking for some inspiration my friend Emily Williams has designed some lovely patterns for the DK Shetland. There’s the Eathie Shawl and also the Callachy Hat and Mitts (you’ll need less than 100g for a hat or pair of mitts). 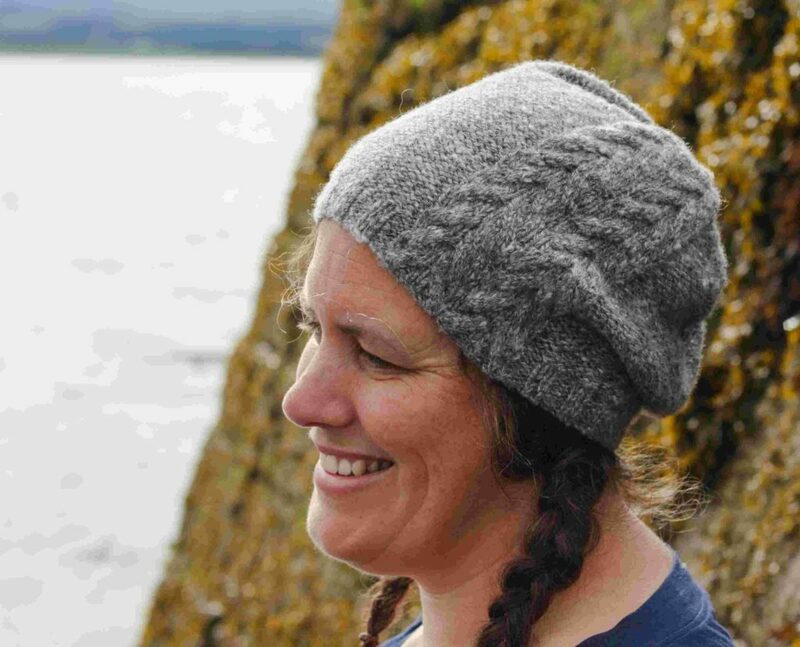 I really enjoyed knitting the Leigh Tee with the DK weight held double – this was an easy and quick knit and the finished top is very wearable. 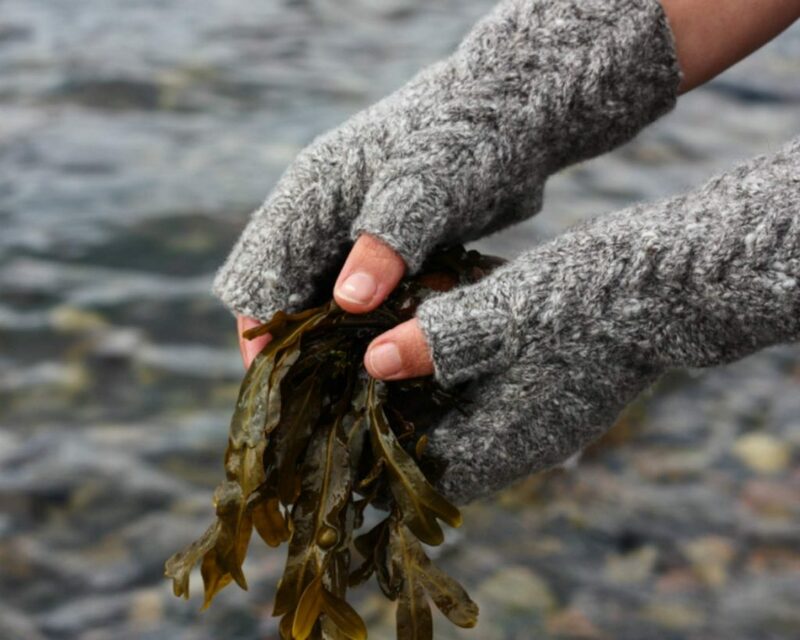 There’s lots more inspiration if you have a look on Ravelry! 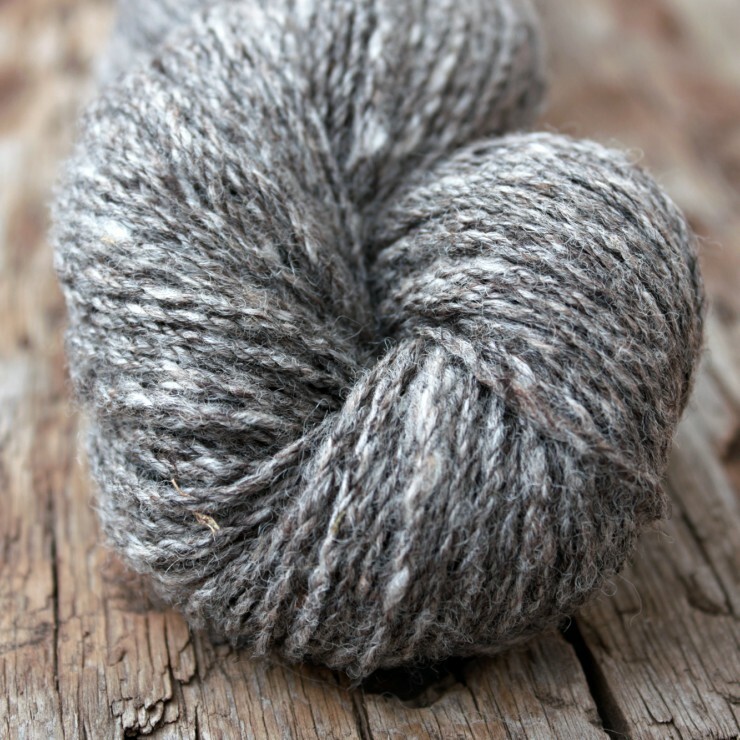 Kate, the Production Manager from The Border Mill, very kindly took some photos of this year’s Grey Heather Shetland DK being spun. I thought you might like to see some of the many skilled steps that go into processing such beautiful yarn. Clockwise from top left, the photos show: 1. three different component colours ready to card, 2. dark grey going into the carder 3. three different component colours as slivers going into the draw frame, 4. two resulting slivers going through the draw frame again, 5. stripy sliver ready for spinning, 6. finished single on the bobbin, 7. singles being plied together, 8. finished plied yarn on the bobbin, and, centre. finished yarn in the skein!